Why didn’t I want to do a post about it? More than the other gifts in the series, Sarah and I both feel that these gifts will be cherished by the recipients. So, yesterday, I contacted the recipients and asked them to not read The Simple Dollar for a few days – I know the recipients, and I’m quite sure they won’t if I ask them not to. 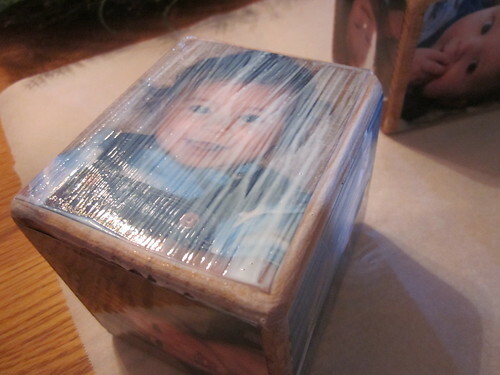 We made photo cubes (or, in our case, not quite cubes – I’ll explain below) for home decoration use or paperweight use! The cubes are made out of cedar, though most woods would also work easily for them. We got the idea from this post at the wonderful alphamom blog and more or less followed the procedure outlined there. I’ll reiterate it here, with some details on our own experiences. I should note that in the below procedure, I’m often stating “we” for tasks both Sarah and I did individually. She put forth quite a lot of effort during the making of these cubes; in fact, I’d easily say she handled most of the work here, particularly in terms of putting more coats of Mod Podge on the cubes throughout the day. The materials you need are largely straightforward. We went to Home Depot, selected a cedar 4″ by 4″, and asked them to cut the board every four inches, making (theoretically) 4″ x 4″ x 4″ cubes. I should note here that we tried both Home Depot and Lowe’s for this purpose – the people at Lowe’s wouldn’t cut the board to our specifications and basically acted as though we were a bother, while the staff at Home Depot were very helpful. The problem with this cut is that the cubes didn’t turn out to be perfectly 4″ x 4″ x 4″. After cutting, the cedar had dried and shrunk a small amount, so we ended up with blocks that measured about 3.5″ x 3.5″ x 4″. We had two choices at this point: we could either shave 1/2″ off of one end of each cube or we could simply go with the slightly rectangular blocks. Our decision was made after mocking up a few of them – we decided to go with the oblong ones. We found that the slightly askew blocks made for much more interesting stacking possibilities if done in multiples. If you want cubes, ask for a tape measure to measure the 4″ x 4″ before they cut it for you. Make sure that it actually measures 4″ by 4″. I went to a local Hobby Lobby intending to just pick up the Mod Podge and the brush, but the person there seemed fascinated with the project. She warned me that the Mod Podge might wind up being slightly tacky when we were finished, and she suggested a clear spray-on finishing spray that would eliminate the tackiness. Both Hobby Lobby and Michael’s were very helpful during our various homemade gift projects. I never went away from either store with disappointment with their prices, product selection, or customer service. Choosing the photographs made for an interesting experience, too. 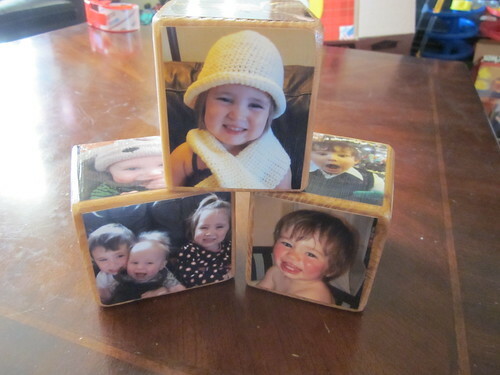 We decided to make photo cubes themed around our children. 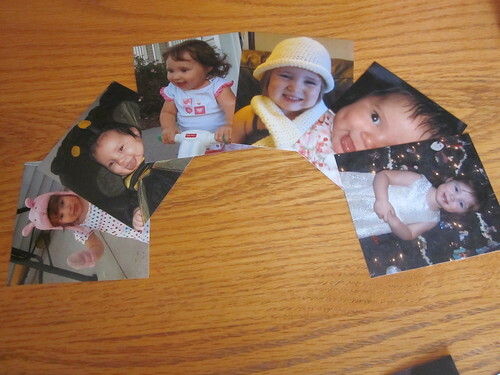 In the example above, for instance, we’ve chosen pictures for a cube full of pictures of our daughter. Now, it’s easy to choose 4″ x 6″ snapshots of your target that are wonderful pictures on their own, but you quickly begin to realize that when you’re cropping them down to fit on the face of a cube, you’re shaving off a lot of the context of the picture. This can quickly make wonderful shots unusable or greatly reduce the likeability of the shot. In other words, when you’re choosing snapshots for such a cube, choose ones that have a lot of potential space to crop away. If a photo is filled with your target, it’s not going to work for a cube face unless you shrink it down to the cube’s size. If you do as we did, which involved selecting photographs out of a big box of prints, this is a really important factor to think about, and considering it up front will save you some effort in finding great pictures that work on cube faces. As is often the case with projects like this, we put the cubes together during a family arts and crafts session, in which the children were making their own projects at the same time (hence the colorful doodles next to the cubes above). We used scissors to trim the photos down to an appropriate size for each cube face. This was more of a process of repeated trimming and comparing to the various faces of the cube until it looked appropriate. At the same time, the cube faces were a bit rough, so we sanded them down a bit. The faces themselves do not need to be perfectly smooth as they will be covered with photos, but the edges should be smoothed down to a nice rounded edge, depending on how exactly you want your cube to look. 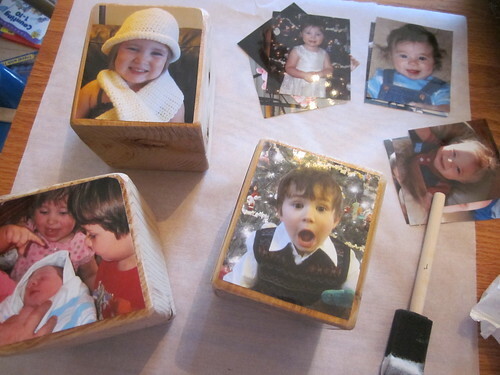 The photographs were attached to the cubes using Mod Podge that was allowed to dry. This worked very well for directly attaching the photos. Typically, we attached three photos, allowed them to dry, then attached the other three photos. This enabled us to not have to sit a drying photo on the bottom side of the cube, which might have caused uneven drying or warping (better safe than sorry). 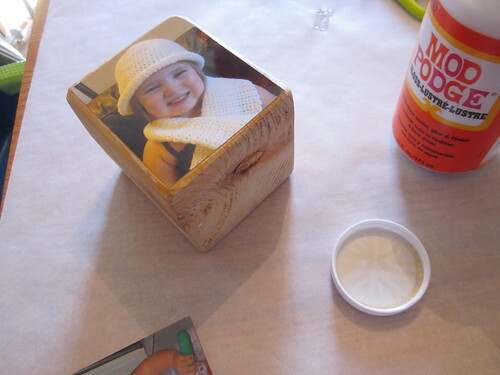 After the photos were attached, we gave three faces of the cube a coating of Mod Podge. When you first put the Mod Podge on, it’ll look like you just coated the face with something white and it’ll look frighteningly bad. Just wait. It will dry clear and look glossy. We applied three coats to each face of the cube. We would coat three faces, let it dry, rotate the block, then coat three more faces and allow those faces to dry. Repeat that procedure three times and you have a finished cube. Usually, we had several cubes going at the same time, so we would put another coat on several cubes all at once and let them dry all at once. Honestly, if you’re going through the effort of making one cube, the additional effort to make more is much less – the leap from one to two cubes is much less than the effort for just one cube. After we had three coats on it, we sprayed the cubes with a clear finishing spray so that they wouldn’t be sticky over long periods. If the cubes are stacked, for example, we don’t want them to become stuck together in a tower. If you’re thinking of doing this yourself, remember you can make cubes of any theme you’d like. Friends have suggested cubes made up of your favorite sports team (perhaps using cropped baseball cards), cubes of the home where you and the person you’re giving the cube to grew up or spent time together when you were younger, cubes depicting a trip taken together, or so on. 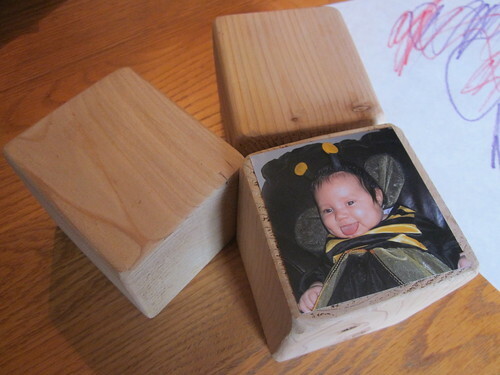 If you know of a person’s passion or something they care about deeply and that can be represented visually, you probably have what you need to make a photo cube for them that will touch their heart. In a few days, I’ll have a final “homemade gift” post that shows what we did to package many of the gifts.